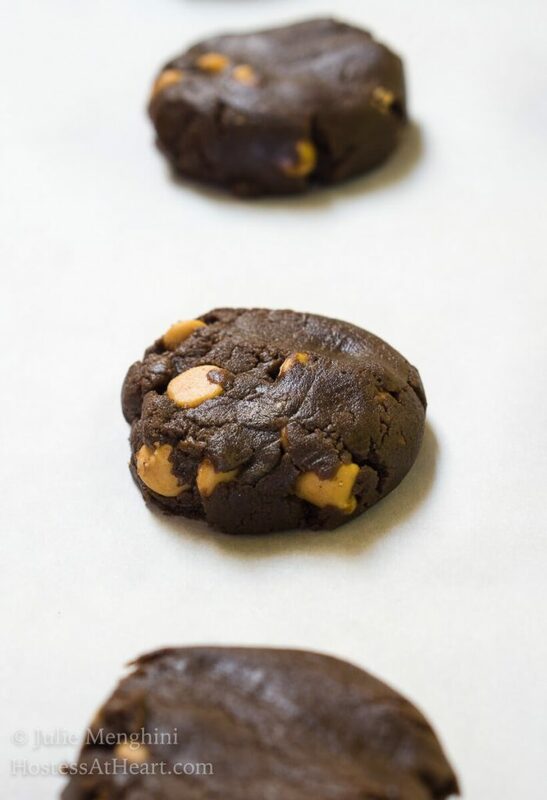 No-Chill Dark Chocolate Peanut Butter Cookies are magic little discs of delicious decadence that will soon become one of your most requested cookies! And, this cookie will make people like you! What is is about cookies? They’re just little discs of magic deliciousness right? Everyone makes them and I don’t know of anyone who doesn’t love to eat them. Please don’t tell me you don’t like cookies. I don’t want to change my opinion of you. 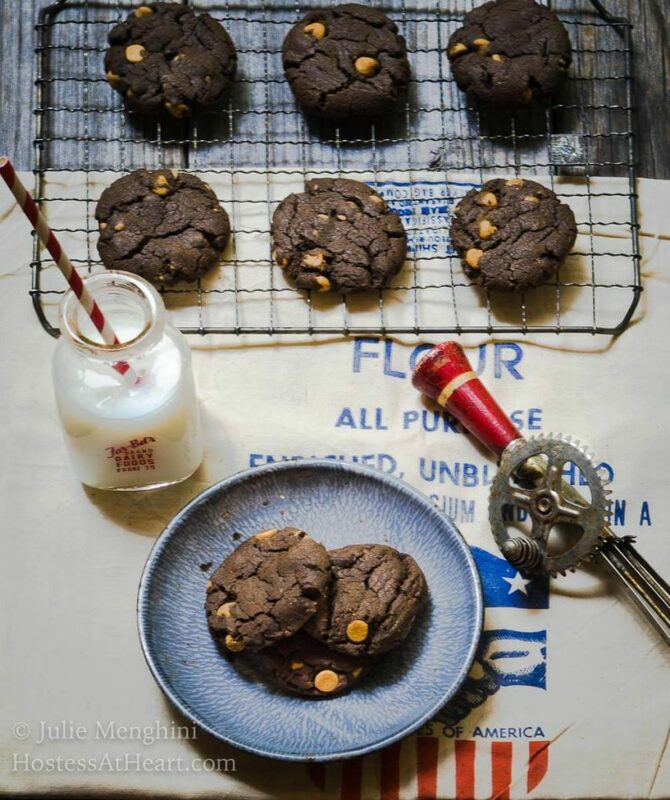 These No-Chill Dark Chocolate Peanut Butter Cookies recipe might change your mind though. I was going to my class reunion recently (no I will not say what year) and was going to take a detour to go visit my mother. I always tell my sisters that mom likes me best because I take her chocolate peanut butter treats, her favorite combination. So, I knew I couldn’t arrive empty handed and took that as inspiration to make a new cookie. Sometimes a recipe is a hit right from the start. 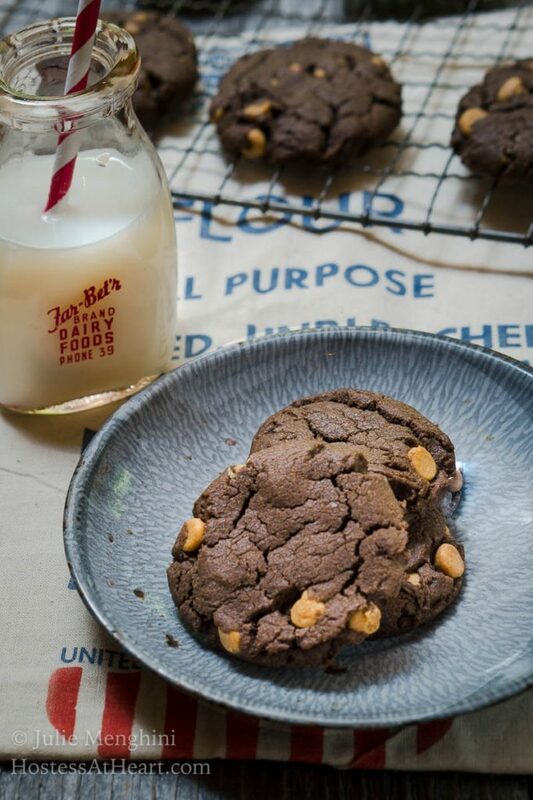 I’ve never had that luck with cookies and this No-Chill Dark Chocolate Peanut Butter Cookies recipe wasn’t an exception. Even though cookies look easy, they can be complicated. Moisture, leaveners, fats and the list goes on. My first attempt resulted in a dry cookie that baked up exactly the way it went into the oven, unappealing and just blah! 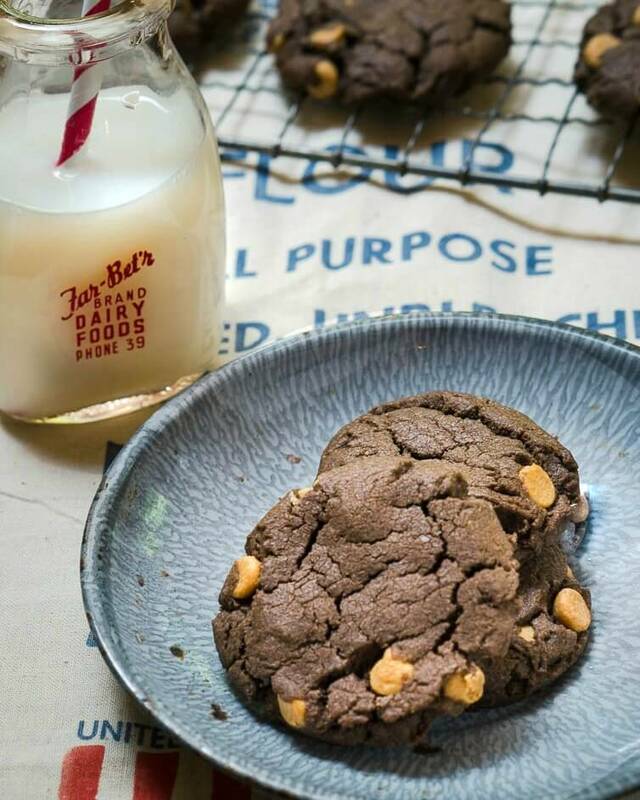 I reduced the flour, added more butter and changed the size of the cookie. This dough is stiffer than some cookie dough so I also elected not to chill the dough. Chilling is what retards your cookies from spreading too much during baking. Big doesn’t always taste better! My final result is a great cookie. I made another test batch and took them to my friends birthday party. Her guests thought they were bought because they were all the same shape and size. I think that’s a compliment but it’s because I use a scoop for the dough and then smash them to about 1/2 inch thick using the back of my measuring cup. Rocket science right? 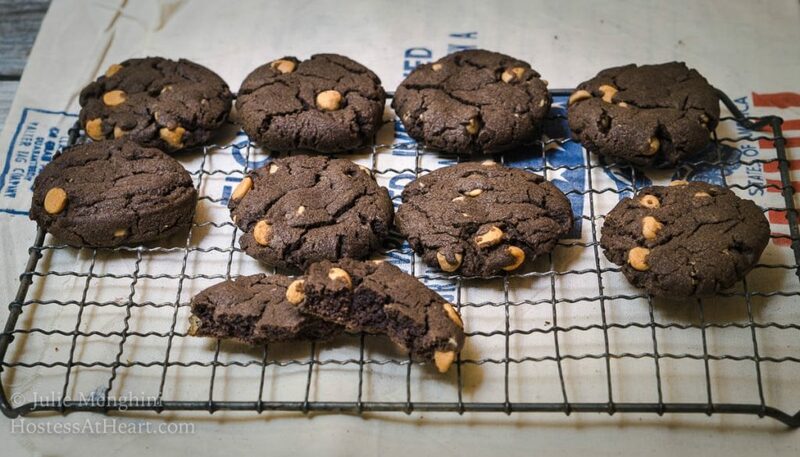 No-Chill Dark Chocolate Peanut Butter Cookies Recipe are little discs of delicious decadence that will soon become one of our most requested cookies! In a large bowl, combine flour, baking soda, salt, and sifted cocoa powder. Whisk together to combine. In the bowl of an electric stand mixer, beat butter until light and fluffy, about 3 minutes. Add peanut butter and beat an additional 2 minutes. Add sugars, vanilla and eggs, mixing between each addition. Beat until combined. Mix in peanut butter chips. 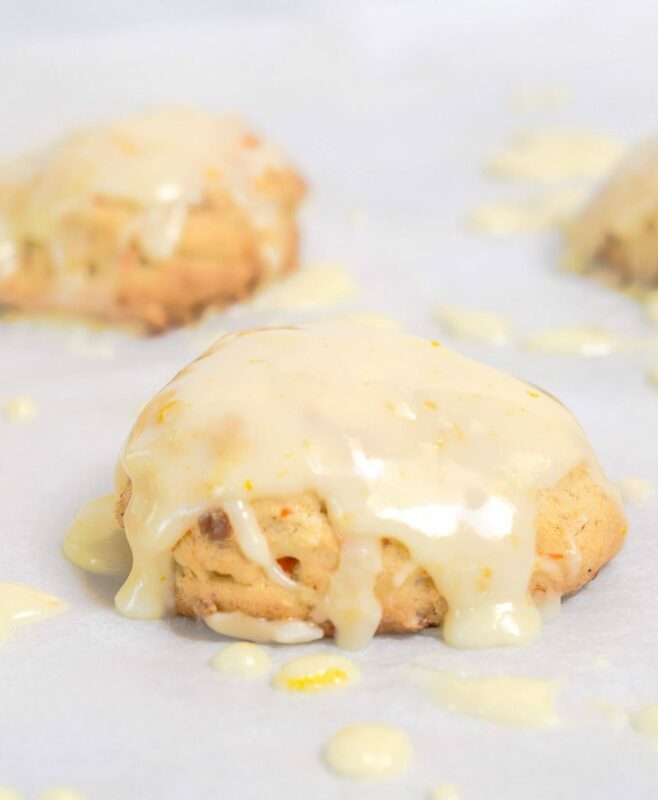 Roll or scoop dough into 2 tablespoon sized cookies and place on a cookie sheet. Using a flat surface (such as the bottom of your measuring cup, smash dough into a 1/2-inch thick circle. Bake for approximately 8 to 10 minutes, turning the pan half way through baking. Don't over bake. Cool 2 minutes on baking sheet and then remove parchment paper to a cooling rack. Cool completely. Store in an air tight container separating layers with parchment or wax paper. 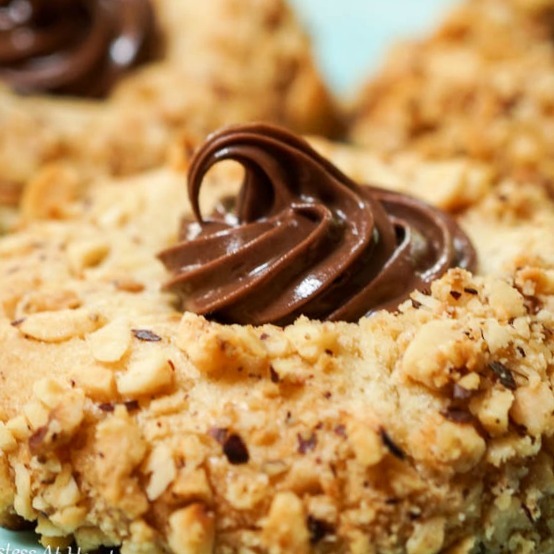 If you are still looking for some great cookie recipes, these are some of my favorites! Hello Julie! I live in Nebraska too!! I love meeting other bloggers from my home state! 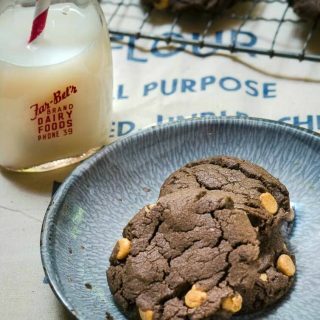 These cookies look very tasty 🙂 Nothing beats a goo peanut butter chocolate cookie and a glass of milk. Hi, Amanda! A fellow midwest girl? I love it! Thank you so much for stopping by and leaving such a sweet comment! There are a few of us in the area, but not too many foodies. Thank you, Judi! How much do you put in a tin? That’s a great idea! Thank you Judi! I will. Thank you, Pamela! They are so easy to put together and definitely make enough to share. 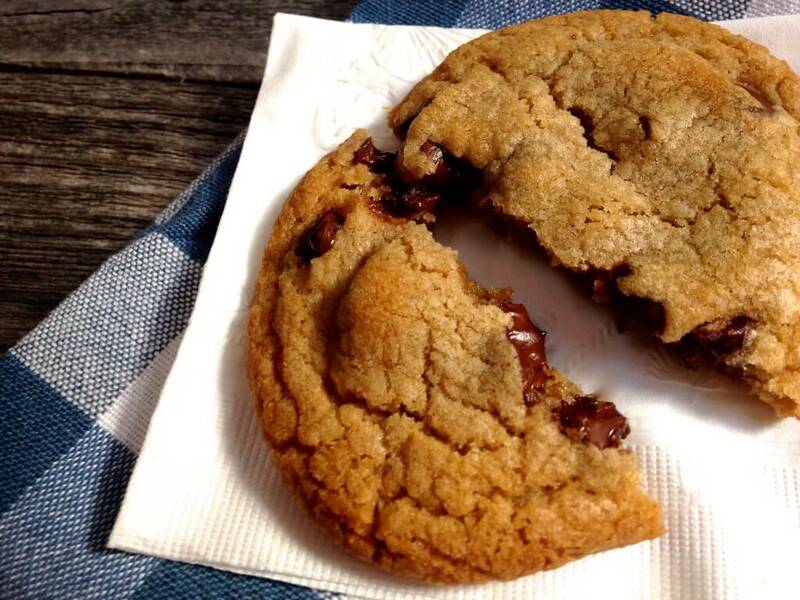 Cookies to me are a perfect single serving, portable, eat out hand dessert. It doesn’t get any better than that in my opinion. And speaking if doest get any better, a delicious cookie I don’t have to chill and wait for? That’s the best kind – yum! Thank you, Lily! The first time I made them I did chill them and it worked so much better to bake them without. Win win! Enjoy your weekend and thanks for stopping by! Whoa! Julie, these look 100% amazing. I love the chocolate pb combo a little more than I should :). I need to try these! Thank you, Kelsie! Stay cool my friend! I can see these becoming a popular Cookies in the house, and demanded by me more often … pinned it! Thank you so much, Sonal! I’m made several batches so far and they’re a bit hard to resist! Thank you Loretta! I know how to get to my mother and that’s through her sweet tooth, particularly chocolate peanut butter. That is an antiquated egg beater! Isn’t it fun? So glad to have you back my friend.